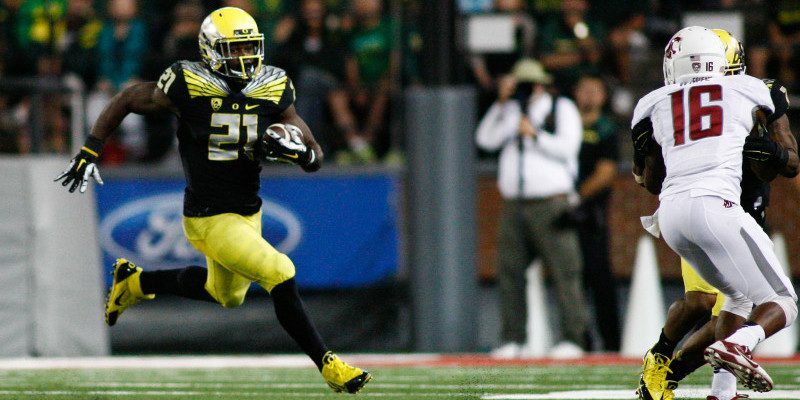 Royce Freeman emerged as an impactful power back for the Ducks during the 2014 season. The soon-to-be sophomore started out as one of the three running backs in rotation and soon became one of the top two rushers for Oregon football by the end of the season. His size, speed and strength are something to marvel at for any opposing defense. If he isn’t able to beat you with his legs, he will literally run right through you. For his freshman year, Freeman ran the ball 252 times, stacking up 1,365 yards. 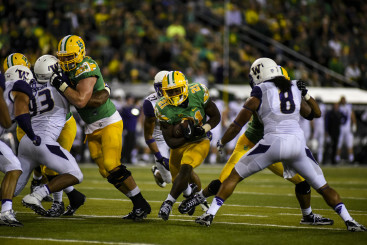 The 6-foot-1, 230lb back ran a majority of the short-yardage plays for the Ducks, where he utilized his skill set by taking the ball straight up the middle. Freeman takes a ball up the middle against the Huskies. Freeman ended 2014 with 18 touchdowns, which was 13 more than Thomas Tyner who also took a majority of the Ducks’ handoffs in 2014. The power back will be an integral part this coming season as the Ducks look to maintain one of the best backfields in the Pac-12, and in the entire league for that matter. The combination of his strength, along with Tyner’s versatile skill-set is something opponents should be worried about. Freeman also showed that he has hands. As a freshman last year, Freeman caught 16 passes with a total of 158 yards and one touchdown. If the Ducks plan to continue using him and Tyner the same way, teams will not know how to plan out their defensive schemes in order to stop the two marvelous backs. Freeman has a lot to prove coming off of a breakout season in 2014. Stay tuned as the freshman plans to continue his outstanding career at Oregon this coming 2015 season.